In the mid 90's, twelve of us attending an AT&T conference in Scottsdale on a sunny and hot (105° F) Saturday, piled into two cars to do a one-day whirlwind tour of Arizona. Leaving 100+ heat in the valley, it was a pleasant mid-70's at the Grand Canyon (alt 7000ft.) Later that afternoon, while returing south down Route 17, we detoured to drive down thru Oak Creek Canyon and see the red rocks of Sedona. On the way down to Sedona, we were hit with a tremendous thunderstorm with nickle-sized hail that left hundreds of dings on the rental cars. The hail was so severe that it accumulated to almost an inch deep; it looked as if we were in a snowstorm. Later that evening, returning to 100+ heat in Scottsdale, Teddy Chung said, "Arizona is quite a state, four seasons-one day." While the summer heat in the valley is 105°-110°, it is not unusual to have temperatures in the 50°-60° range at the top. 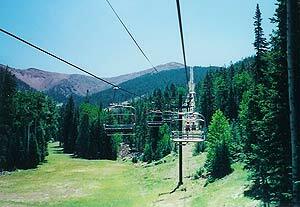 We were dressed in shorts, short sleeves and light windbreakers for our usual 45 minute ride up the ski lift. About a third of the way up, the top of the mountain became obscured by a quick moving cloud (with a large storm behind it). A few minutes later it began to rain, soaking us both quite thoroughly. Then, to add to our discomfort, the rain changed to hail and began to sting our quickly numbing bare legs. Nearby lightning strikes (with the thunder less than 'one thousand one' away) were making the cables and towers of the ski lift sizzle. In a matter of minutes, our beautiful summer day had transformed into an uncomfortable situation with no means of escape (other than jumping). We were herded into a small unheated Ranger's building with about 20 other poor souls to ride out the storm. We were stuck there for an hour and a half; cold, wet, cranky, and after an hour or so, we began shivering uncontrollably. As our fingertips grew numb, we realized that we were in the beginning stages of hypothermia. Even the blankets we discovered in the Ranger's building didn't help with temps in the 40's and soaking wet clothing. When the lightning let up, they let us ride down to the bottom in the pouring rain with blankets and garbage bags as ponchos. 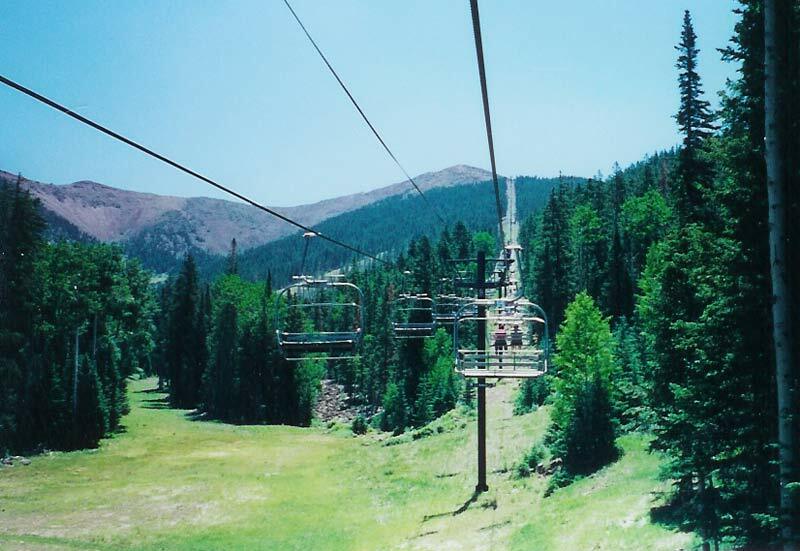 The chair lift was cranked up so that a normal 45 minute ride took only 20 minutes. A couple of hot chocolates later, still shivering and numb, we left the heat on in the Explorer about half way home (or until the temps got back into the 90's). Arriving home that evening, we were right at home in the 105° dry heat.